Eagles Eyes Classic Aviator night vision glasses offer you the night vision you need to be able to see everything super sharp. Night time is often difficult for many who drives at night. Due to extra headlights and other lights glowing all around, a survey suggests it is up to 3x times dangerous than day time driving. High-quality HD night vision lenses improve color, clarity and optical definition so you can see better. Eagles increase your vision drastically at night so that you can clearly see everything at night. It has a lot of benefits compared to its price and even for anyone who starts to get headaches and migraines. Even during the low lights and fog conditions, this yellow tinted Eagles Eyes glasses will help see better. 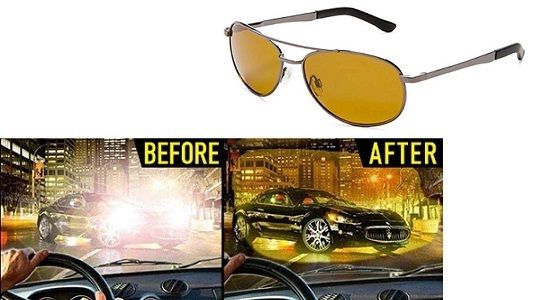 When you are driving for a longer time during the night, your eyes become fatigued and start getting tired and drowsy, these glasses will help reduce that. These glasses are lightweight and fit perfectly on top of your normal glasses and don't require a prescription or alter vision when wearing glasses or contact lenses.